Myth: The Caesarean section procedure ultimately derives its name from Julius Caesar, who is often (falsely) claimed to have been the first baby born via Caesarean. We now know that this account is incorrect on several points. First of all, babies had been cut from their mother’s wombs in numerous cultures long before Caesar was around. In fact, this was actually part of imperial law in Rome known as the Lex Caesaria. The law, established in the time of Numa Pompilius (715-673 BC, well before Caesar’s time), stated that if a pregnant woman died, the baby had to be taken from her womb. The second point that The Suda gets wrong is on Caesar’s mother- she did not die in childbirth. Aurelia Cotta survived to see her son to adulthood and acted as one of his political advisers. Some historians even believe that she survived him. As Aurelia did not die in childbirth, it is extremely unlikely that she underwent a Caesarean section. As noted, at the time, the operation was used as a “last resort” method of trying to save the baby’s life. As far as historians can tell, nearly all- if not all- operations ended in the mother’s death in those days. This was likely due to unsanitary conditions which led to infection, as well as haemorrhaging resulting in too much loss of blood. The first known such successful operation where the mother survived in Britain didn’t occur until the early 1800s and in America just shortly before that. And even in 1865, the survival rate for a woman having a C-section was only 15%. So it’s very unlikely that if Aurelia did have a C-section about 1000 years before and survived, that her unique accomplishment slipped through the pages of history unnoticed. That’s not even considering the fact the a C-section wouldn’t have been done until physicians was sure she was going to die anyway. So she’d have had to dually survive whatever they had thought was going to kill her and then procedure. Because of just how amazingly accurate the OED usually is, I’ll give them the benefit of the doubt here and guess they are referring to one of Caesar’s ancestors rather than the famed Emperor. After all, both “Julius” and “Caesar” were family names— and, indeed, the first to bear the Caesar name in his lineage was named Numerius Julius Caesar. All that being said, it is possible Caesar’s false association with the name may have contributed to the procedure being called that, but the evidence for this is scant at best, and even if so, it wasn’t the Emperor that was the ultimate origin of the name, but possibly one of his ancestors or from the Lex Caesaria, as stated. Much more compelling, in my opinion, is the fact that the term for the babies cut from the womb after the mother died was “caesones”. This seems to be yet another very likely origin for the later “Caesarian Operation” that became “Caesarian Section” in 1598 when Jacques Guillimeau published a book detailing the work of midwives. Another proposed origin of Caesar’s surname is from “caesaries”, meaning “hair”. Once again, as Emperor Julius Caesar wasn’t the first to go by this name, if this is the true origin, it did not come about because he had a full head of hair at birth. Yet another commonly held origin of Caesar’s name is that it referred to one of his ancestors eye color- from “caesius” (bluish-grey). As mentioned, the first known woman to survive a C-section is supposedly the wife of a pig castrator, Jakob Nufer, in the 1500s. The story goes that after his wife labored unsuccessfully for several days, he made a single cut in her stomach, took the baby out, and then sewed her up like the pigs he dealt with. The woman then went on to have five more children, including a set of twins. Some sources question the reliability of this story as the first documented account of this didn’t occur until nearly a century after the fact. The first C-section in America where the woman survived was on none other than the wife of the doctor who performed the operation, Dr. Jesse Bennett, and his wife Elizabeth Bennett. This event occurred in 1794. C-sections are now quite common, with about 33% of babies born in the United States in 2012 born via C-section. Around 75% of twin births were also done via C-section. The procedure has more risks associated with it than natural birth, but it is far less risky than it was through most of history. It’s thought that C-sections became more popular in the 20th century when the skeletal disease rickets rendered many women incapable of giving birth naturally due to pelvic abnormalities. Approximately 46% of babies born in China are birthed via a Caesarean section. How Did the Caesarean Section Get Its Name? 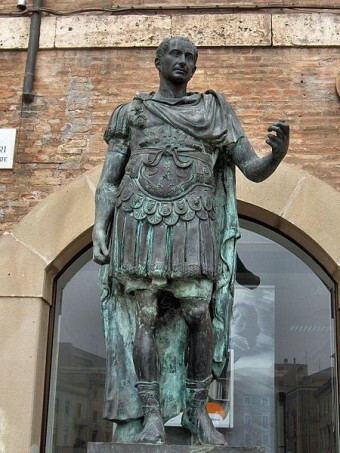 Another point: The name “Caesar” – a “cognomen”, an extra name which served to distinguish branches of the family with the same “nomen” (surname) – had been in the family for a good number of generations before Gaius Julius Caesar the Dictator. There were other branches of the Julius family, with other cognomens, but they had largely fallen from any position of importance (if related to the main branch) or never had any importance (if descended from a freed slave or enfranchised client who took his patron’s surname and added his own cognomen to it). In his day, it was generally said that the Caesar surname referred to being unusually hirsute, which caused the great man to be mocked for going bald prematurely and thus not living up to his cognomen: indeed, the adjective “caesaries”, “hairy” did exist. However, it is debatable whether the family cognomen derived from that adjective, or whether the adjective derived from the name. It IS, of course, possible, that the Caesar surname does indeed derive from a child who survived being cut out of a woman who was dying in childbirth – not from the Dictator himself, but from one of his ancestors a dozen generations previously: this would, of course, mean that the name of Caesar does indeed derive from the “lex Caesarea” which provided for this eventuality. It is also possible that when the law in question was passed, in Roman Republican times, the Consul of the year was a member of the Julius family: the law would thus have been known in full as the “lex Julia (name) Caesaria (description of the law)”, subsequently giving the consul a cognomen appropriate to the law that he was famous for passing, and that this cognomen subsequently became hereditary by customary usage. It’s funny how you took whatever the time it took you to find out all this about the C Section, and while doing it, you didn’t find out that Julius Caesar was never an Emperor. He died as a Dictator, but the first emperor was his nephew Octavious.